Each year we bring to West Michigan a clinician who will lead all who come into new dimensions of harp playing. In the past we have had workshops from some of the most well known and loved harp teachers in the country, including Dennis Rybicki, Rhett Barnwell, Frank Voltz, Serena O’Meara, Sunita Staneslow, and Kim Robertson. The opportunity to study exclusively with one master harpist for a day and a half is a rich experience. Come and spend time with Angi Bemiss from Atlanta, Georgia will share her knowledge and love of the harp in HARPfest 2017: Harp Blessings – Simplicity, Beauty and Elegance. “Making it complicated is easy. Keeping it simple is an art.” This describes the underlying philosophy of Angi Bemiss. 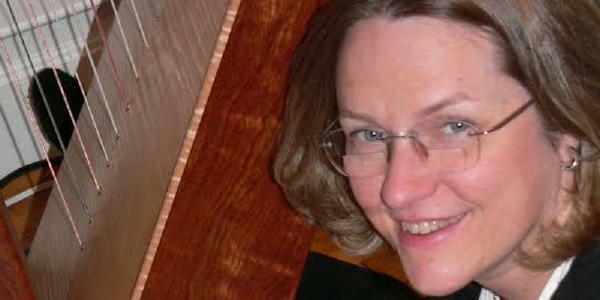 A Certified Music Practioner since 1998, Angi has provided live therapeutic harp music to hundreds of people. She is nationally known as an arranger, composer, and clinician. Her workshops will include working with chords to create lovely arrangements from lead sheets, exploring the therapeutic aspects of harp playing and learning how to make good use of modern technology. She will give a concert on Friday evening. Angi will give a public concert at 7:30 p.m. on Friday, August 18. Tickets are $15 in advance and $20 at the door. There is no charge for workshop participants. All others may order tickets by clicking here. See Registration Information and Sign Up Form for viewing and printing. Q: Will individual concert tickets be available to non-registrants? A: Yes, tickets are $15 in advance and $20 at the door. Q: How many can attend HARPfest? A: Space is limited, so register now. Q: Should I bring my harp? A: Yes, by all means. If this is impossible, contact Kelly Yousoufian, michiganharpcenter@gmail.com, 248-288-4277, to rent one at a nominal fee. A: Please indicate this when you register. We will do our best to accommodate you. Q: What can my non-harping companion do if he/she chooses to not attend any workshops? Q: What will I do for dinner on Thursday, August 17, if I am arriving on that day? A: The city of Lowell is ten minutes away with several sit down and fast food restaurants.